As a blonde, red is always a staple color in my lipstick arsenal. 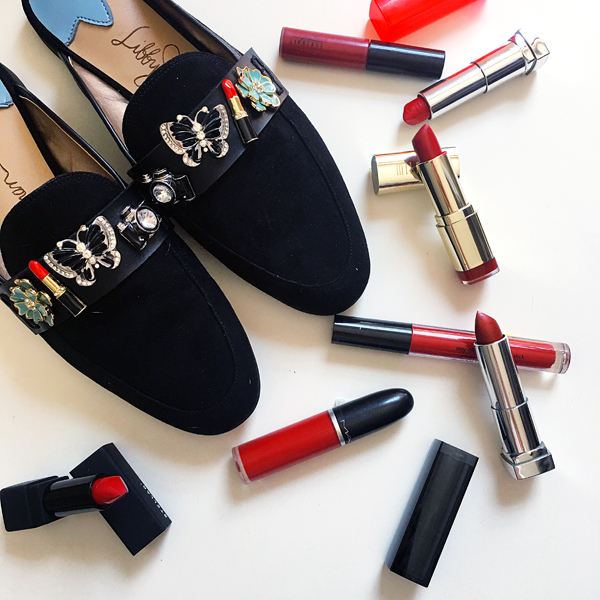 In honor of #NationalLipstick day, I was happy to slip on my Libby Edelman for JCPenney mules (how cute are those little lipstick charms?!) and pop on a red pout. While you’ll find me in a red lipstick at least once a week – usually more – today was one of the first times I organized my reds and narrowed it down to my favorites, sifting through the rubbish and the rubies! MAC Retro Matte Liquid Lipscolor (Fashion Legacy) – True story: I borrowed this from Glamazon Diaries and we both agreed it was so flattering, she was nice enough to let me keep it and it hasn’t left my bag since. With a liquid-suede finish, the pigment of this matte liquid lipstick is bold and long-lasting, taking you from day to night without reapplication. I have never used another liquid lipstick that has such a long-lasting color without drying out! Stellar Infinite Lipstick (Supersonic 03) – Stellar’s Infinite Lipstick has a rich, satin finish that offers full coverage in one swipe (seriously!). Stila All Day Liquid Lipstick (Beso 10) – This liquid lipstick has a very smooth and creamy texture that isn’t super thick and spreads easily without bleeding. Tip: Apply two layers for an intense pigment. Milani Color Statement Lipstick (Best Red 07) – Known for making a statement, Milani boasts vibrant colors infused with vitamin A & C, making the lipstick feel good on your lips. Maybelline Color Sensational Vivids (Infra-Red) & Color Sensational Matte Metallics Lipstick (Hot Lava) – Infra-Red is a popping shade of red with an impressive coverage but needs a bit of prep prior to use for a smoother finish and to increase longevity. Maybelline’s Hot Lava Sensational Matte Metallics Lipstick is an orange-red with warm undertones that is comfortable to wear (lasting approx 3-4 hours) but isn’t highly pigmented. While I usually shy away from anything with sparkles, this metallic would be a great pigment for fall or winter. MAC Lip Glass (Ruby Woo) – If you’re going for a subtle sheen, opt for Lip Glass like Ruby Woo but don’t be deceived by how dark it looks in the packaging. Unlike my first experiences with sticky Lip Glass that always spilled all over my purse as a tween, this gloss does not feel tacky. Tip: Apply with a brush for a more even coverage.